From Cave Junction, drive five miles north and turn left on Eight Dollar Mountain Road. The intersection is located near mile marker 24. Follow Eight Dollar Mountain Road for 0.9 mile to the large paved turnout on the left. There is a sign with information about the drive at the west end of the turnout. The tour starts at this sign and continues on Eight Dollar Mountain Road for 15 miles to the trailhead for Babyfoot Lake Botanical Area. 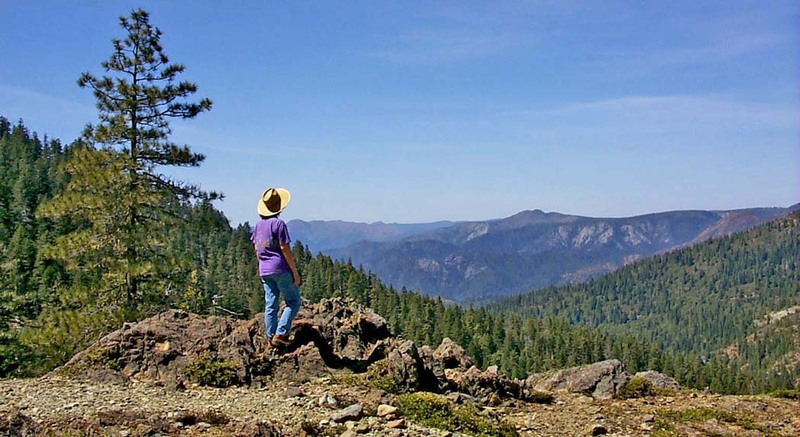 This is a 15 mile tour that follows a gravel road to the Kalmiopsis Wilderness with many scenic vistas seen along the way. 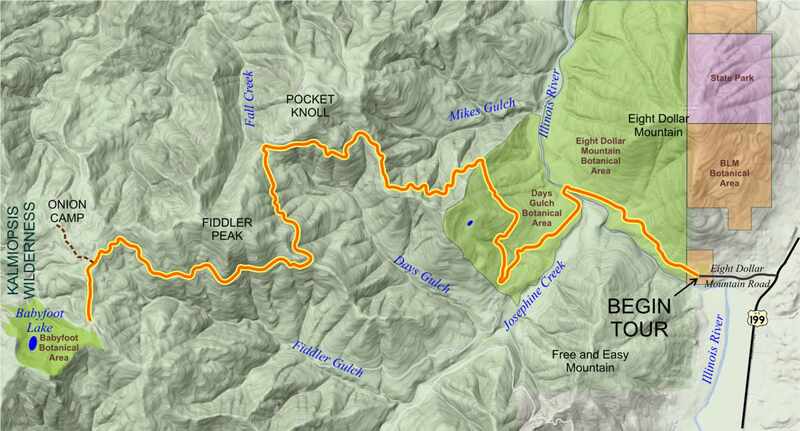 The total elevation gain from beginning to end is 2,500 feet. Anyone wanting to take the tour should assure the tires on their vehicle are suitable for travel on gravel roads. The road guide will provide basic instructions to help keep you on the correct route but travelers are advised to carry a Forest Service map anytime they travel in the back country. The TJ Howell Botanical Drive is highlighted in yellow showing the route it follows as it climbs from the Eight Dollar Mountain Botanical Area to the Babyfoot Lake Botanical Area in the Kalmiopsis Wilderness. Click image to see an enlargement.